The Nestle Benecalorie Unflavored Supplement 1.5oz Case of 24, Model #28250000, is anchored in advanced science and research. Nestle Healthcare Nutrition offers nutritional solutions for people with specific dietary needs related to illness, disease states or the special challenges of different life stages. 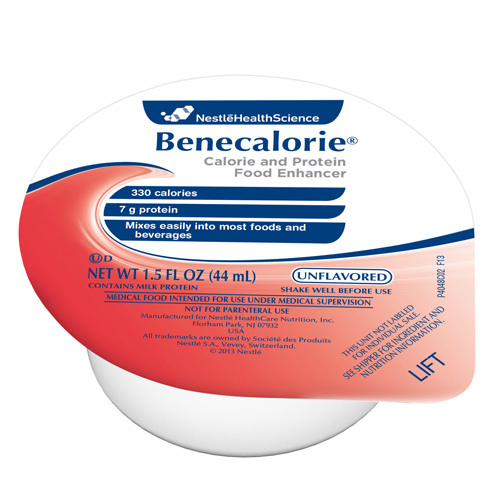 The Nestle Benecalorie Unflavored Supplement 1.5oz Case of 24 is a calorically-dense supplement that blends into most foods and beverages to increase protein and calorie content. One 1.5 oz serving provides 7 grams of protein and added vitamins C and E. Benecalorie is a great way to enhance foods with more calories and protein. For use under medical supervision.